Oct. 6, 2017 - Since 2010, Canadian wood pellet exports have increased by 240 per cent, from one million tonnes in 2010 to 2.4 million tonnes in 2016. Last year’s exports totalled $408 million. 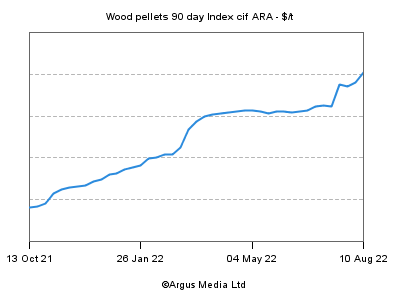 Pellet producers have invested in new plant capacity, employed more people and paid more taxes while continuing to grow an industry using a raw material that was formerly a waste product of the sawmill industry. Obviously, the lion’s share of credit must go to pellet company owners, investors, and management for leading the way. However, not many people know that two government organizations have played a key role in our industry’s success, namely Natural Resources Canada (NRCan) and Forestry Innovation Investment (FII). NRCan and FII each manage programs that support the export marketing efforts of Canada’s forest industry, including the wood pellet sector. NRCan operates the Expanding Market Opportunities Program (EMO) with the goal of maintaining and growing international forest product markets while promoting Canadian forest products as an environmentally responsible choice. Projects funded under EMO are cost-shared with industry and provincial government partners. FII operates the Market Initiatives Program (MIP). FII is the B.C. government’s market development agency for forest products. FII works with industry and the federal government to help maintain, create and diversify markets for B.C. forest products. FII’s MIP encourages the development of export markets and new market segments so as to diversify the forest industry and sustain employment. Like NRCan’s EMO, MIP-funded projects are cost shared with industry and other levels of government. Each year in November, NRCan and FII co-operate in calling for proposals from industry associations for the following year’s export marketing projects. Proposals are reviewed by an advisory panel that includes NRCan and FII representatives, as well as independent forest industry experts. Since 2010, WPAC has participated in the annual call for proposals and has successfully obtained funding for export marketing initiatives in Europe and Asia. Usually these projects are cost shared 40 per cent by NRCan, 30 per cent by FII, and 30 per cent by WPAC. Total annual spending has been about $200,000. WPAC’s development of a safety data sheet for bulk and bagged wood pellets. As part of their call for proposals, NRCan and FII each set out the annual objectives for each program. Project proponents are advised to have their own strategic marketing plans. Proposals are required to show how they comply with such NRCan and FII’s objectives, how they align with strategic marketing plans, and must include measurable indicators of success. Successful applicants are required to enter into written contracts with NRCan and FII and to submit financial and project reports every four months. FII and NRCan conduct financial audits on a sample of industry associations each year to ensure that money is spent strictly in accordance with the contracts. Since the 2011/2012 fiscal year, NRCan and FII have audited WPAC’s program expenditures approximately every second year – sometimes two years in a row, but never more than three years between audits. Currently NRCan and FII have engaged an independent consultant for a detailed program review of the effectiveness of WPAC’s activities over the past five years. While all this reporting, auditing, and reviewing can be painful for us, I have to admit that it helps WPAC to keep a laser focus on complying with our contracts and on meeting the NRCan and FII’s objectives. We know that government programs can come and go as priorities change with time. Both NRCan’s Expanding Market Opportunities Program and FII’s Market Initiatives Program have been working successfully for about 15 years and we urge both the Government of Canada and the Province of British Columbia to continue their programs for the long term. Certainly, these programs have been highly beneficial to the wood pellet sector as evidenced by a 240 per cent increase in exports since 2010 and with every indication that such growth will continue. And, of course, the Canadian and provincial governments have benefited financially and will continue to benefit though the resulting increases in corporate and personal income taxes, GST, provincial sales taxes and so forth.